My passion for watches developed in stages: First a simple seed was planted, which then started to take shape after being nurtured, until it finally bloomed - after a sprinkling of luck. It happened before I started graduate school. I was single, working long hours, and spent what free time I had loitering about. Collecting wristwatches was not on my list of thingsto expend effort on. In retrospect,that’s both a shame and a blessing. The shame is that I could've bought a lot of watches back then, when I had more financial freedom. The blessing is that since I didn’t have the time and energy to research my purchases, I probably saved myself the stress of overspending on a watch, or worse, a huge headache if I ended up buying a frankenwatch. Even though I was yet to feel passionate about watches, I did recognize their beauty. In fact, it was hard not to, as my work environment was strong with wristgame. Among the watches that I encountered, one made a lasting impression: An enamel dial Chronomètre Royal by Vacheron Constantin. It wasn’t the watch itself that jumped out at me; it was how good the watch bearer looked wearing his timepiece. I knew of the gentleman to be a reserved, capable, and strong-willed man. With the enamel dial chronometer on his wrist, all of his aforementioned qualities were amplified. I complimented the gentleman on his watch. To my surprise, he offered to let me wear it for the remainder of our meeting. I strapped it on and instantly felt like a better man. When I reluctantly returned the watch to him, he patted me on the back and said, with a grin “hard work sometimes pays off.” Our engagement came to an end, and we parted ways. That evening, I checked the MSRP and thought the gentleman to be absolutely insane to spend that kind of money on jewelry ANDto let me wear it for an hour! What I didn’t realize at the time was that he had deviously planted the seed of watch addiction in me - justwaiting for the right time to blossom. When I entered graduate school, and subsequently got married and became a father, there was a drastic change in my lifestyle. Having a family now, I could no longer loiter about like I did in my days of being a bachelor. But one luxury of being a graduate student: I had fewer deadlines to meet on a daily basis and could devote some time to a hobby - namely watches. The only problem is that I had a family to feed on a limited income. Given this financial constraint, I decided to look only into watches that could be resold easily, in case unexpected needs came up. Following that criteria, I narrowed my search for my first watch down to a ref. 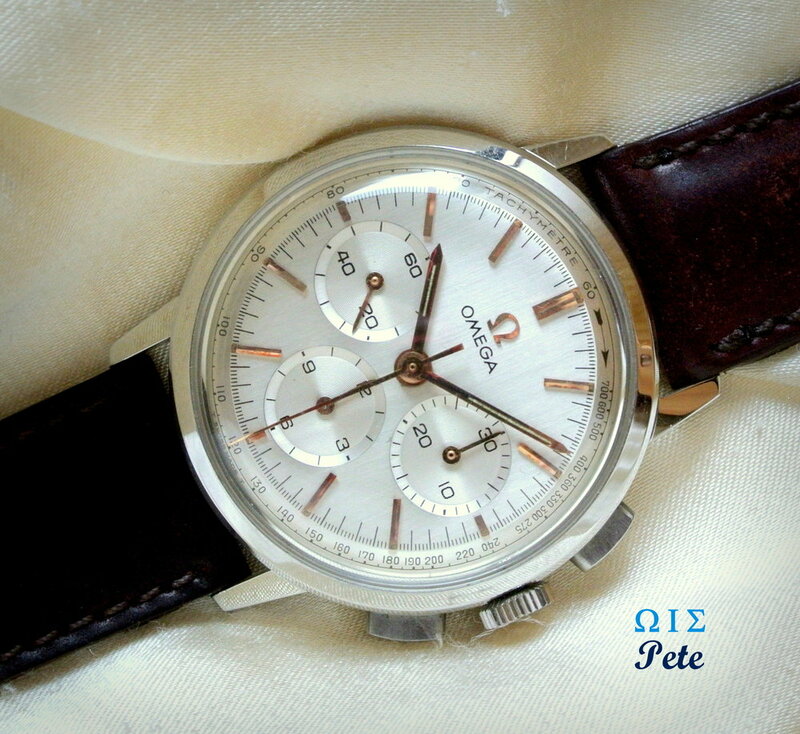 14060 No-Date Sub or a modern Speedmaster: They both had stable prices and could be resold quickly - if need be. The only issue is that they failed the most important test: My wife’s “eye” test. Whenever I tried on either watch, she gave me a lukewarm reaction. And whenever I was about to pull the trigger on purchasing one, she’d always say the following magic words: “if it makes you happy,” with an eye-roll. Thus, these watches never happened. I had to broaden my search. 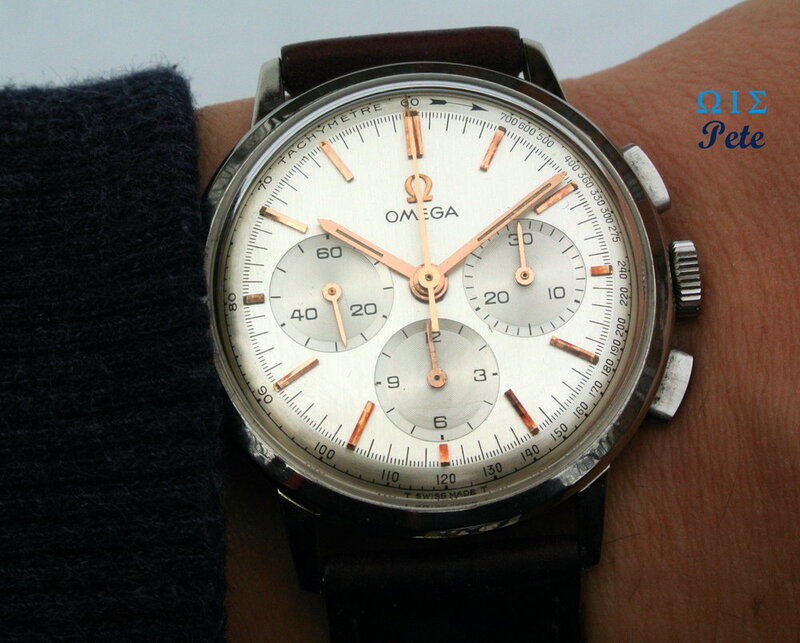 After sifting through many candidates, I came across an old - but near mint condition- Omega chronograph from 1965. My wife was immediately on board. She said, half-jokingly, “if you wore this on our first date, I probably would've married you a lot sooner.” My immediate reaction was to get that piece (of metal) off the market so that no other man gets it. However, I had my reservations. First, I knew nothing about vintage watches. Second, it’s hard to gauge the proper price to payfor this model because very few come on the market, especially ones in near mint, unpolished, condition. In the listing, there was mention of a caliber 321 movement. I had no idea what that meant in terms of the value of the watch. And when I googled cal. 321 vs cal. 861, everything pointed to the cal. 861 for better serviceability. So I naively said to the seller, “I would buy this in a heartbeat if it were acal. 861 rather than a cal. 321. Would you be willing to work on the price?” The seller patiently and kindly replied, “actually the 321 is a column-wheel movement and is more collectible than the 861; but I will work on the price anyway.” I honestly didn't believe a word of it! However, by then, I had already been bewitched by how balanced and pristine the watch looked, so eventually a deal was struck - with me paying little attention to its resale potential. This act of placing emotion before reason turned out to be an important step for me in watch collecting. Without this step, I would be “renting” watches for their enjoyment. Instead, I now own a watch that I love. The longer that I’ve owned this piece, the better a team we’ve become. Believe it or not, this watch has become my lucky charm! Whenever I wear the watch - to take an exam or during a presentation - I seem to always end up with a great outcome. 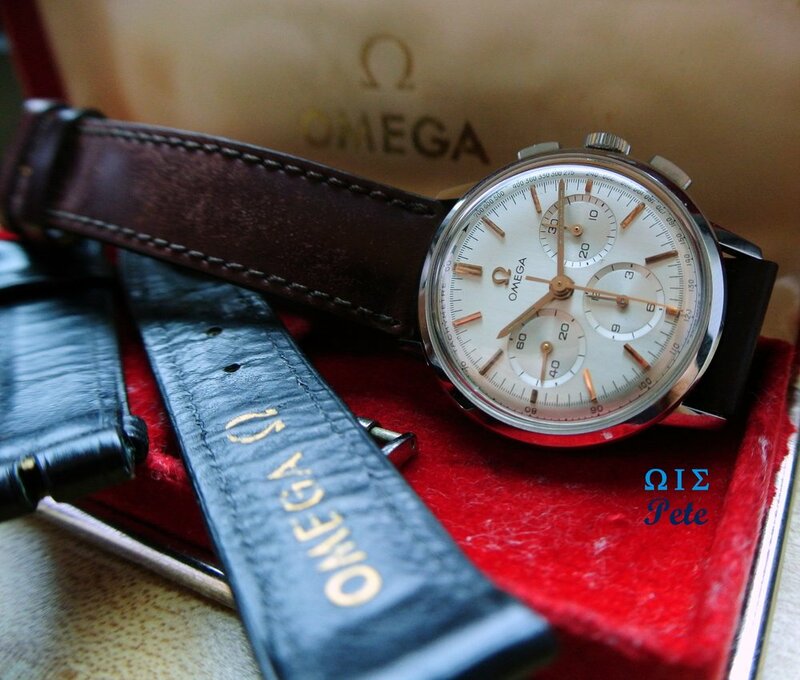 And whenever I don't wear it - and get a disappointing result or have a bad experience - I reason to myself that things would’ve turned out different had I been wearing my Omega. I’m willing to go so far as to say that the ONLY reason why I’ve survived graduate school thus far is because I had this watch to back me. To thisday I still don’t know its market value, nor am I interested in knowing, because I sure as heck don't plan to part with my good luck charm. 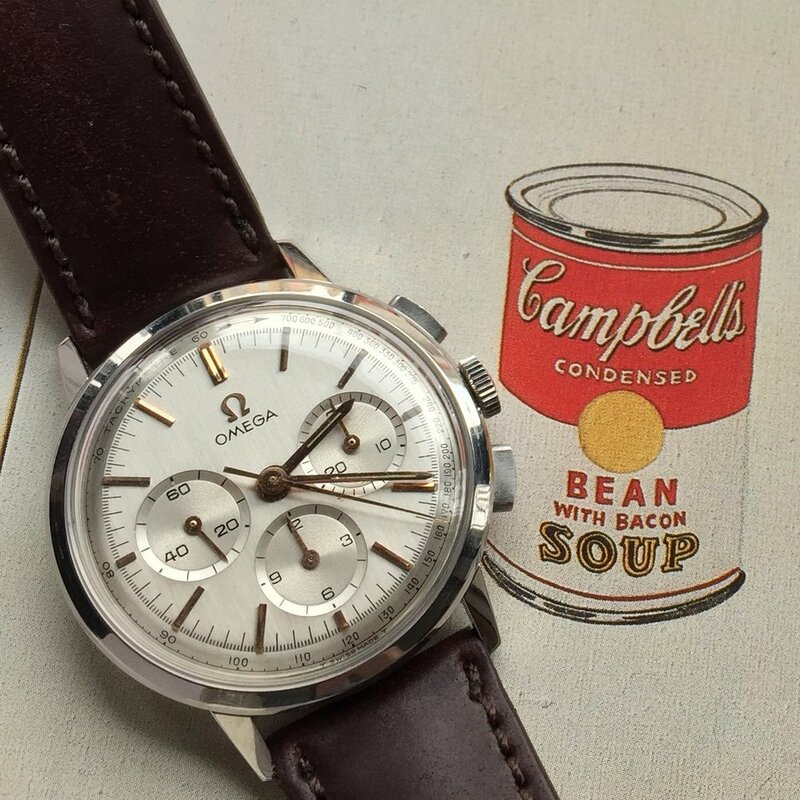 My good fortune with my good ol’ Chrono doesn’t end there… This is the timepiece that I wore to my first watch get-together - held by Chicago’s #commonwealthcrew. And through that event, I’ve met many people I now consider friends, includingNick and Andrew from Watch Patina. This hobby of ours is not just about watches, but also about the people wearing them. The watches get us excited, but it’s the people that really make watch collecting an enjoyable and rewarding endeavor. I am very grateful to the generous gentleman who piqued my interest in watches, just as I am thankful to the patient collector who sold me this lucky charm - despite my ignorance at the time. The friendships I've fostered through this common passion are beautiful, and I look forward to their development as my timepiece collection matures. 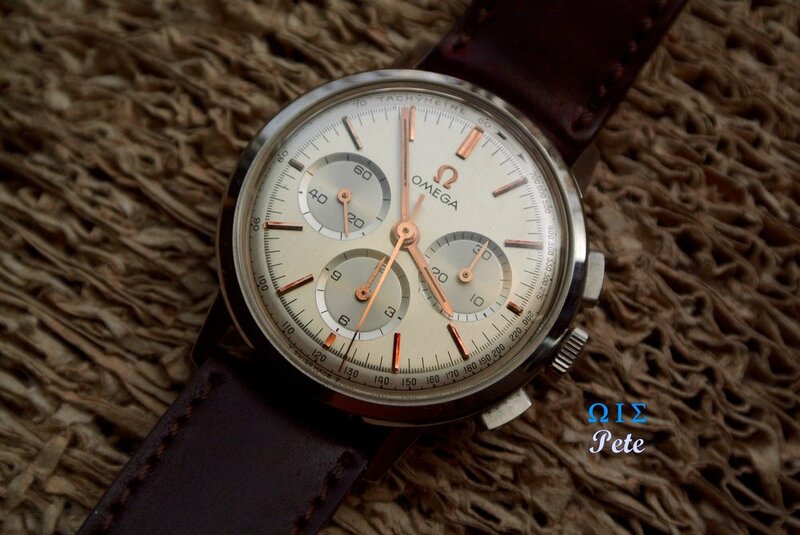 To see what other watches Pete has added to his collection - since acquiring this vintage Omega Chronograph - follow him on Instagram @wispete.